A serious fly angler likes to be prepared for any type of condition, be it flat calm, big wave or light ripple. It's also important to be equipped with the right range of sinking lines: Di 3, 4, up to 7 when the conditions dictate a deeper approach. 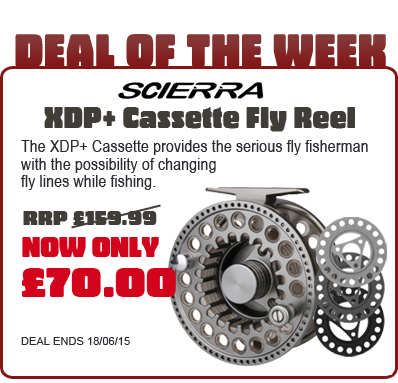 So a fly reel that gives you the flexibility to change fly lines quickly and easily is a big advantage and the Scierra XDP+ with it's 3 spare spools is just the job! The XDP+ features a carry case, lightweight construction, water-proof break system, saltwater proof and allows the fly angler to change fly lines in an instant. It's the perfect reel for all your lines and now you can get this excellent fly reel, which normally retails for 160 quid for just £70.00! But you better hurry because this deal is sure to sell out fast!